Specially developed in Canada to withstand cold temperatures, Boyne is a true winter-hardy plant that produces reliably heavy yields. 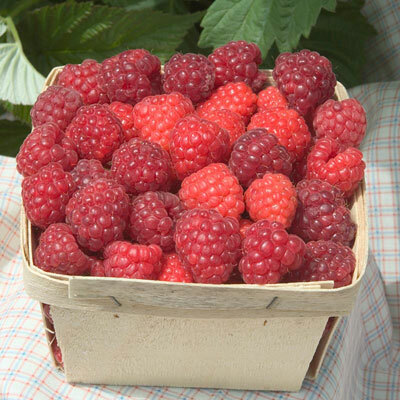 Very sweet, flavorful berries appear in abundance in early summer for a season full of delicious treats such as muffins, pies, sauces and preserves. You'll still have enough fruit to freeze for later use. These deep red jewels are the perfect cold-weather pick-me-up in nutritious smoothies or a warming bowl of oatmeal. 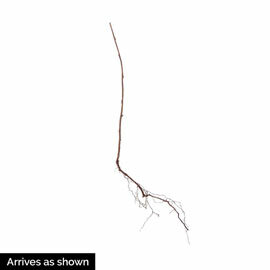 Perfect for northern gardens, it also exhibits excellent disease resistance and reliable growth! Grows 3-4 ft. tall with a 2-3 ft. spread. Self-pollinating. Zones 3-7. No. 1. 1-yr. plants. Soil Requirements: Organic, well-drained, slightly acidic, sandy loamy soil. Pruning: In early Spring before new growth begins, cut the old canes as low to the ground as possible to encourage buds to break from below the soil surface. Remove and discard the canes. Obviously, this approach cannot be performed with Summer-bearing red raspberry cultivars that bear fruit on second-year canes.